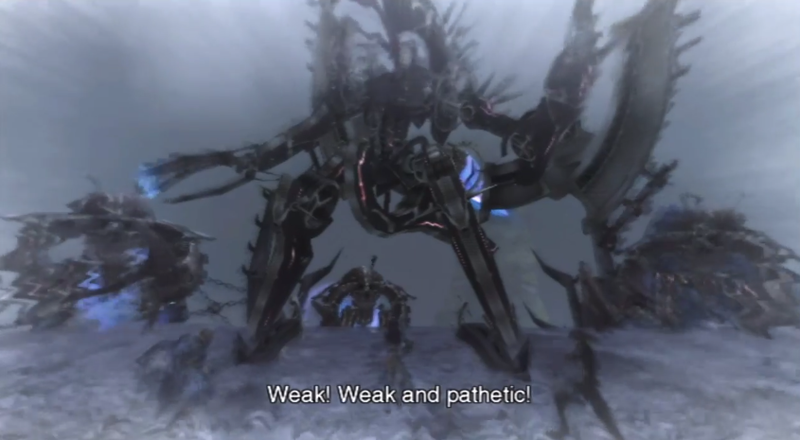 The twenty-third chapter of my Xenoblade novelisation. We’re finally out of the Ether Mines, and we meet an old foe! The party headed back up the elevator and into the room with the rotating arms. They hopped on to one of the arms and rode it across to the southern section of the room, where there was a freight elevator leading outside of the mine. “You see! What did I say?” grinned Reyn. “We’re all impressed.” Sharla fought to keep her amusement out of her tone, while Shulk laughed. He pulled a lever and the elevator started to ascend. They were about halfway up when the whole structure shook, and then stopped moving. “Hey, why’ve we stopped?” Reyn asked. As soon as he finished the sentence, a giant Mechon leapt on to the platform with them. The party were shocked to see it was Xord, but he was different. Green smoke wafted up from his body, and the metallic sheen on it was gone; it appeared to have rusted and peeled away. What was perhaps the strangest thing of all was his newfound muteness. The Mechon, who before would not stop talking, did not utter a word as he stared down at the party. 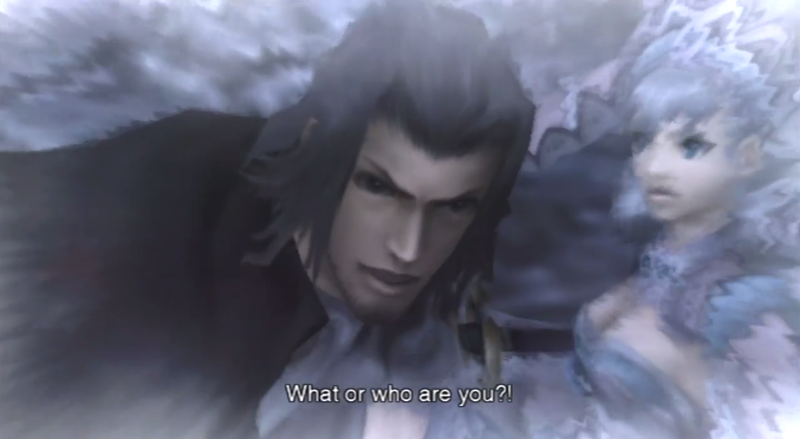 “Not him again!” exclaimed Reyn. “This one doesn’t give up!” said Sharla. 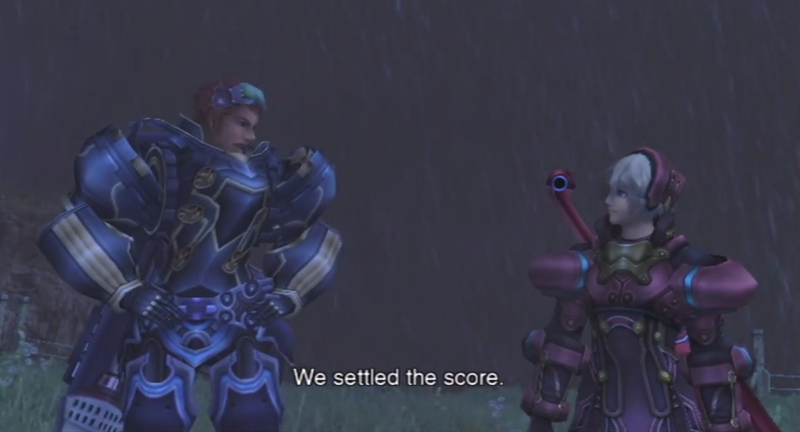 “This is our chance, guys,” said Shulk. Xord, still silent, drew his hammer as he stared the party down. Otharon had Juju in the corner, watching the battle unfold. 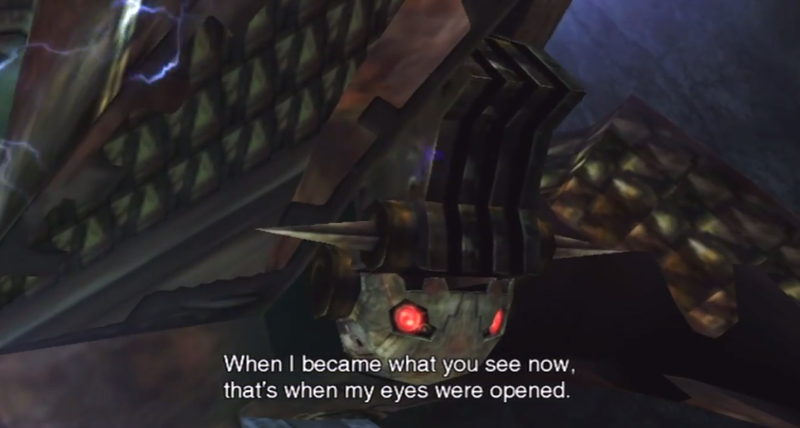 Shulk recalled that day back in Colony 9. When she, in the mobile artillery, had blasted a weakness in the side of Metal Face’s head. I bet the ether river did the same thing, but to his entire body. 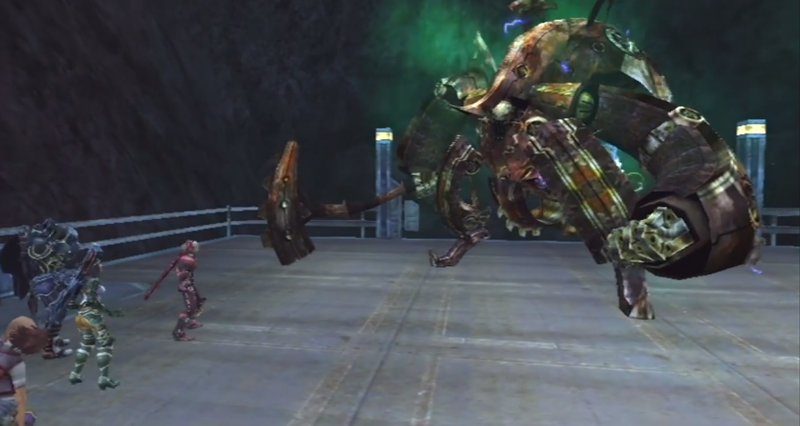 “On it!” Reyn ran towards the machine, dodging a blow from his hammer and sinking his gunlance deep into its leg. He then slashed outwards, taking a chunk of metal with it. 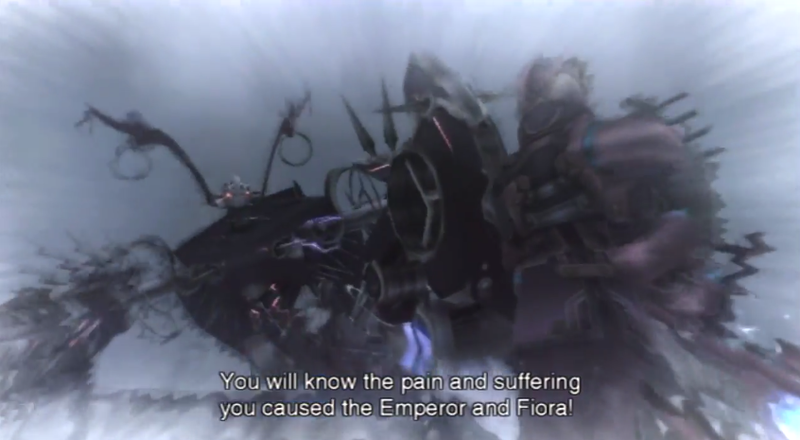 Shulk, Sharla and Otharon cheered as Reyn sliced off another chunk of metal, widening the hole in Xord’s leg and weakening the limb. 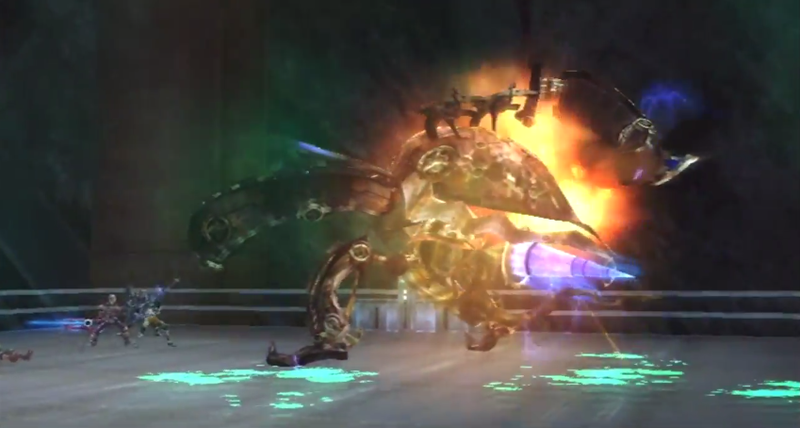 Sharla fired at the other leg as Shulk ran towards it. 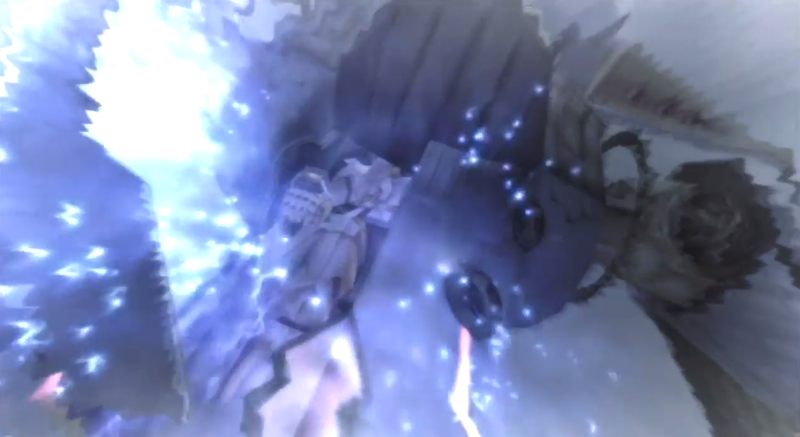 Xord swung at Shulk, but he ducked to avoid the blow. 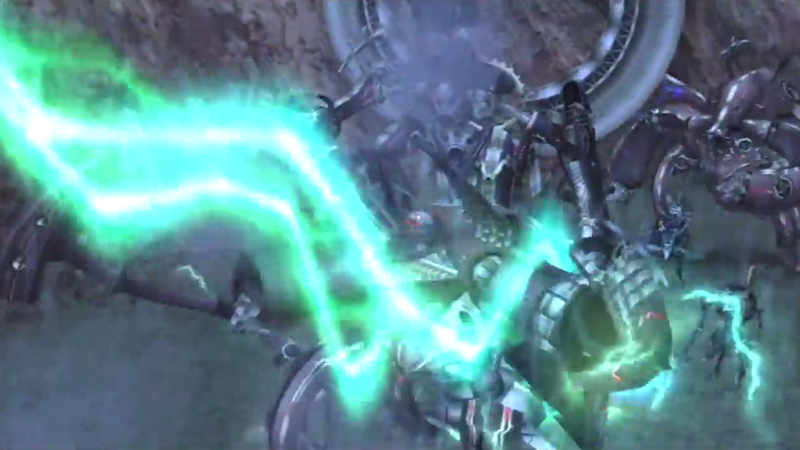 The attack placed the machine off-balance as Reyn chipped away at its leg, until finally he fell to the ground. 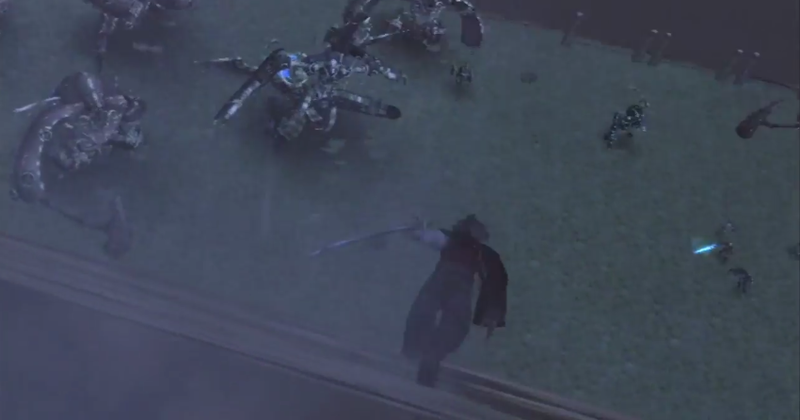 Xord tried and failed to rise; the amount of metal missing from his leg was too much, and what was left would not support his weight. Reyn dashed back over to Shulk and Sharla, watching Xord. Finally, the machine started to make some noise. He grunted as he struggled to approach the party, crawling across the ground. He rose his hammer. “Still hungry!” He started to bring it down on Shulk, but Sharla ran in front of him and shot an explosive round at Xord’s shoulder. The force of the shot blew off not only that arm, but his other one and his legs as well. With no way to move, Xord slowly rolled backwards to the edge of the elevator, groaning. Blue-green coloured ether was splattered across the floor, reminding Sharla of the red stuff at the base of the Central Pit. She lowered her weapon. 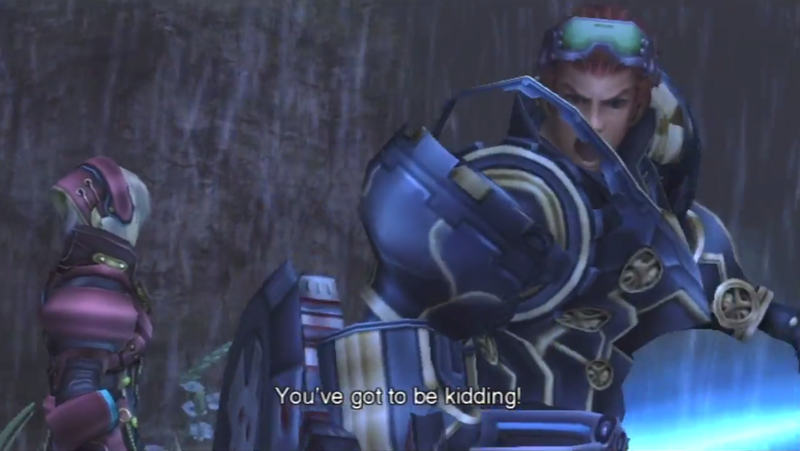 “Did we get him?” Reyn asked sharply. 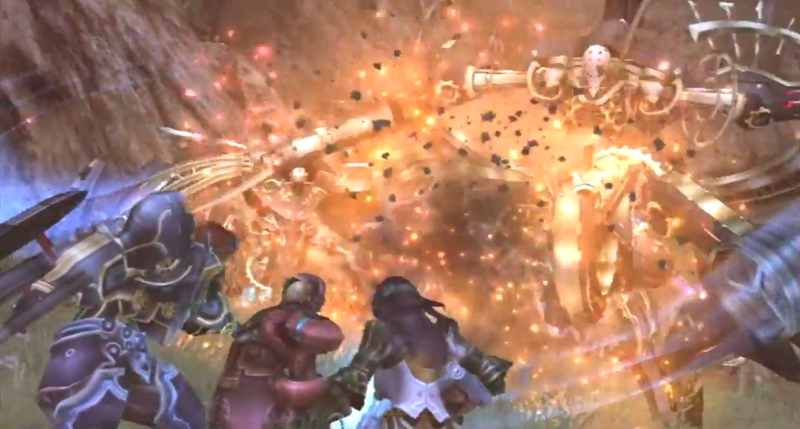 “Xord!” Shulk, Reyn and Sharla watched as he bounced off the ground and out of sight. A large explosion from below blinded the party as the elevator started moving again. “Get back!” shouted Reyn, picking up Juju once more. The elevator took them back up to the surface, around the corner from Colony 6. As soon as it stopped, the party ran from the elevator as fast as they could; they were running for less than a minute when the elevator they had just left exploded into blue flames. They all cried out and covered their ears. “Where are we?” Juju asked, looking around. “Hope I’m not interrupting!” Shulk and Reyn spun around and were shocked to see Metal Face rising up from the cliff face behind them. “It’s him!” Shulk shouted. 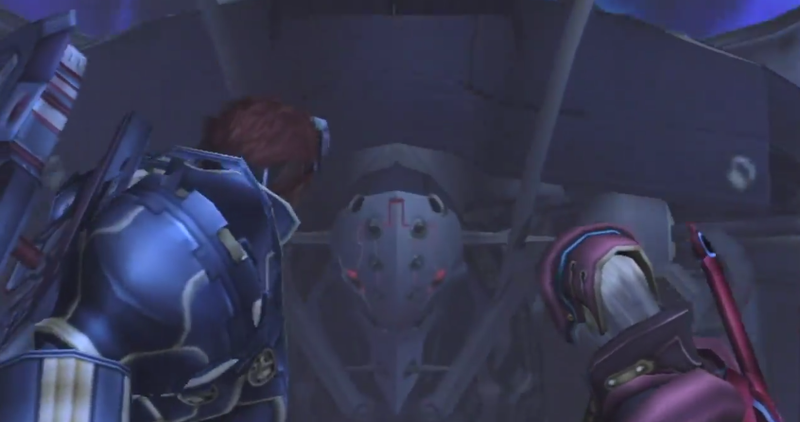 “Metal Face!” He and Reyn cried out as more Mechon dropped from the sky; M72 units with their propellor-like appendages, the small M69s, and many, many more Mechon that looked just like Xord. Same face, same shape, same hammer. Reyn was angry. “Oh, this one can talk ‘n’ all!” he growled. 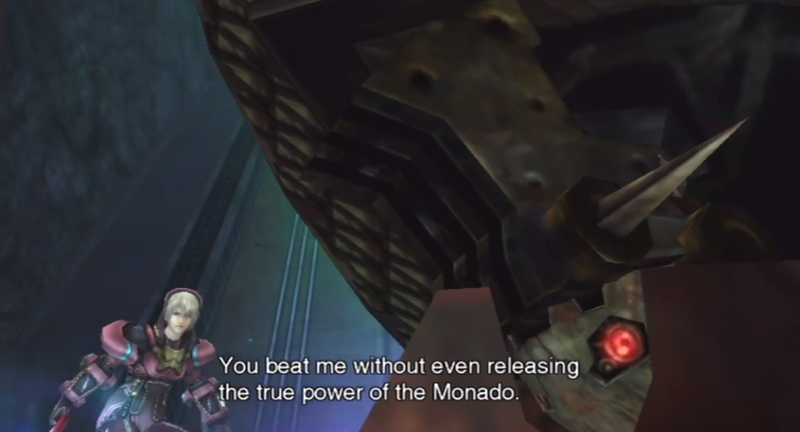 His whole body shaking with rage, the Monado activated in Shulk’s hands. 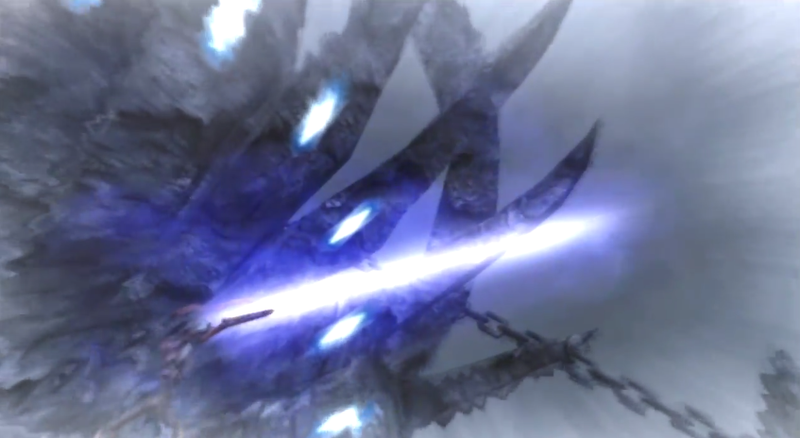 “Talk all you want.” He could feel the Monado pulling on his mind, and fought to keep control of the sword. He flicked it behind him. 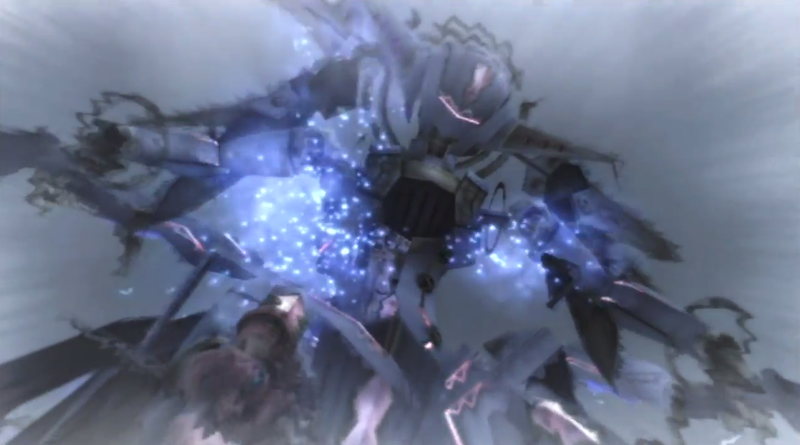 “Because those words will be your last!” Hr ran in to attack Metal Face, who met Shulk’s attack with one of his claws. 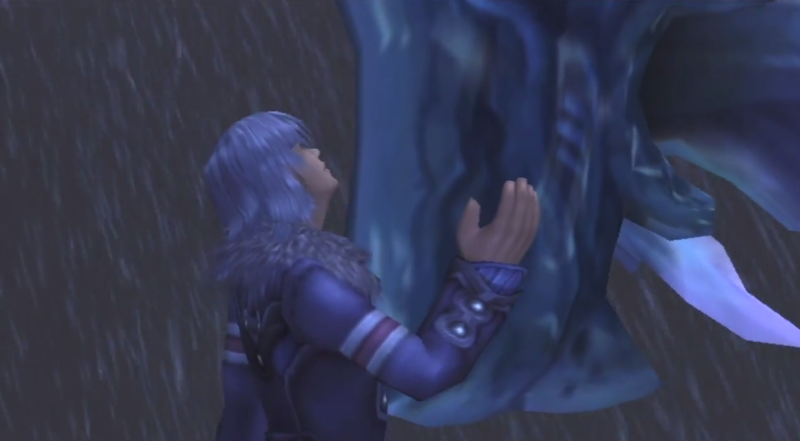 Shulk cried out as he was knocked back. 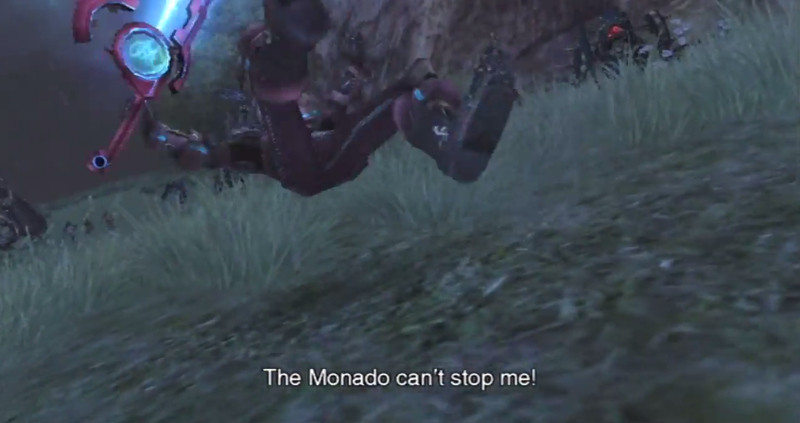 “The Monado?” The Mechon sounded amused. “Heh, it’s been a while.” He drew his claws together. “But you should know by now. The Monado can’t stop me!” He slammed his claws into Shulk, taking him unawares and sending him flying back towards the party. “Shulk!” Reyn stopped his friend as he slid towards him across the ground. “Shulk!” Sharla was quick to join Reyn at Shulk’s side. “I’m gonna…” Reyn looked up at Metal Face, furious. 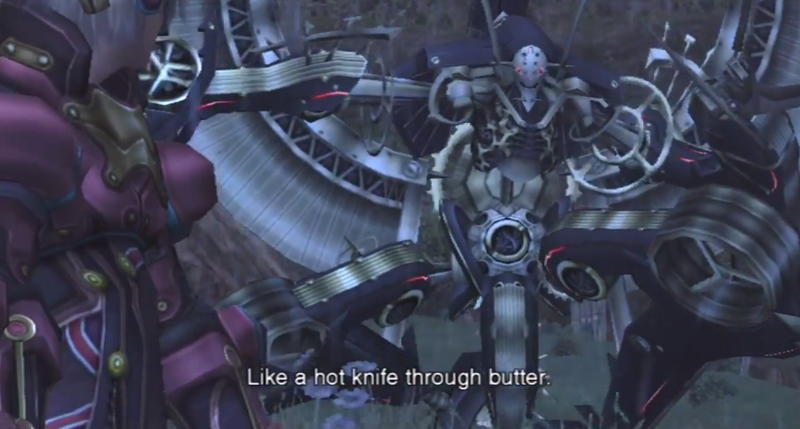 “Any way you slice it, the Monado ain’t gonna work, boy,” said Metal Face. 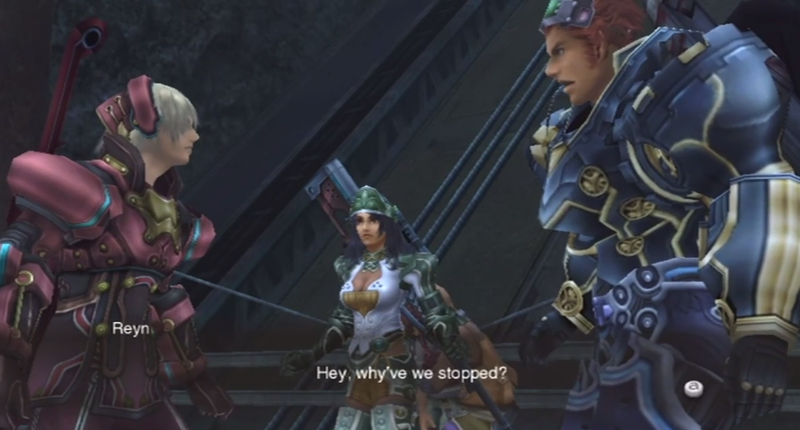 “Didn’t work then, won’t work now.” Shulk, supported by Reyn and Sharla, raised his head to glare at his foe. “Now, time to cut you down to size!” He drew his arm behind him, and the party prepared to dodge. They had to cover their eyes as Metal Face cried out and the ground before them exploded. “What? !” Metal Face looked up the cliff face to his right, where a blonde-haired man sporting a red bandana was pointing his gun at the faced Mechon. A dark cape flicked past Dickson as its owner charged down the cliff face, sword in left hand, to confront the Mechon. Dunban sidestepped an attack from an M72 and immediately sliced off its arm before hacking into an M69, causing it to collapse. “How did you…? !” Reyn was astounded. “Sorry to have kept you,” Dunban grinned as Dickson slid down the cliff behind him. “Looks like we were just in time.” He looked over at the horde of Mechon. “We can talk later.” He readied his katana for battle. “Let’s get this over with, shall we? Shulk, Reyn, Dickson! Let’s go!” Dunban charged into battle with his comrades in tow, Otharon and Sharla hanging back to fire into the machines. The Xord-like Mechon were lined up in two rows ahead, unmoving. 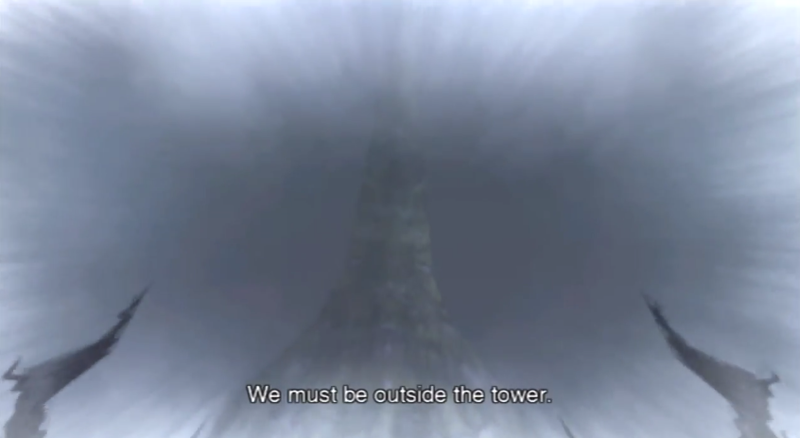 If they join the fight, thought Shulk, there’s no way we can win. But why weren’t they? They must be playing with us. The thought compounded Shulk’s fury. The party shot down and cut through the Mechon before them, but no matter how many they destroyed, more would scuttle forward to take their place. 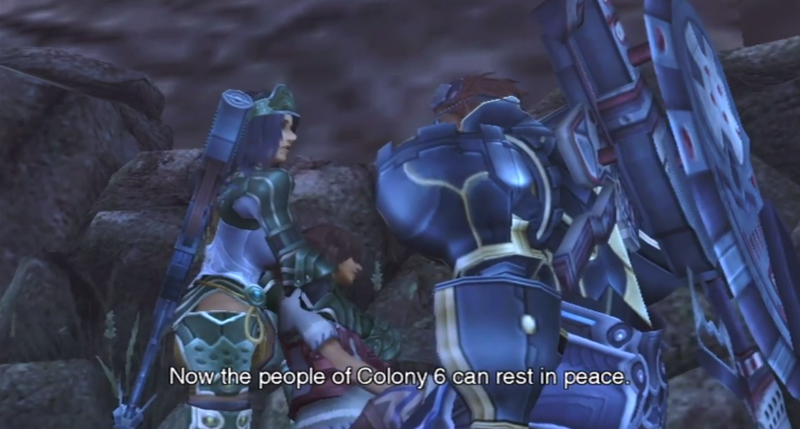 “There’s no end to them,” Reyn commented. “Where are they coming from?” An M72 in front of him spun its claws in challenge, flanked by a couple of M69 units. “If only the Monado would work on these things!” Shulk yelled, frustrated. Dunban’s head whipped around at his words. 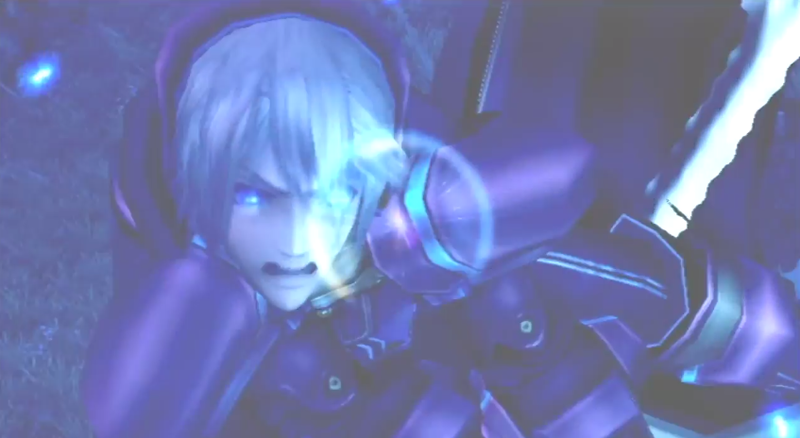 “Focus, Shulk!” He turned his attention back to the M69 pressing into him. Another M69 had snuck up on Shulk while he was distracted. 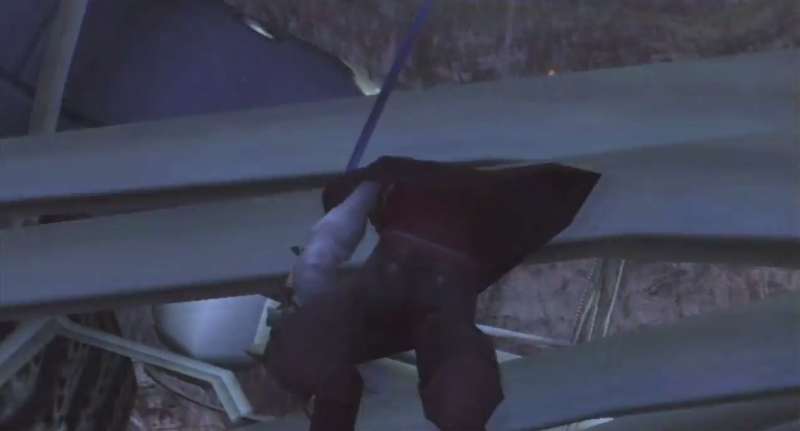 “Look out!” Reyn tackled his friend to the ground as its sickle sliced through the space that had been occupied by his body only moments before. “Reyn!” Sharla shot at the Mechon before it could attack the boys again. “Look at this, metal brain!” Dickson loosed a shot at the faced Mechon, who blocked it effortlessly with his hand. “That it, grandpa? !” he roared. “You may be able to block a projectile,” Dunban dashed past Dickson and towards Metal Face, “but let’s see if you can block this!” He leapt into the air and brought his sword down on the faced Mechon, who brought its claws up to meet Dunban’s blade. The Mechon laughed. “Tell me. How does it feel to be such a pathetic hero?” He flung Dunban away from him, who skidded across the ground. Dunban gritted his teeth, clutching his crippled right arm. “You OK, Dunban?” Shulk called. “Does it hurt?” mocked the machine. “I bet it does. It hurts because the Monado won’t work for a bunch of losers,” he drew back his arm, “like you!” He brought his claws down on Dunban, who only just managed to roll out of harm’s way. “What are you?” Dunban demanded. “Save it, I ain’t interested,” replied Metal Face. 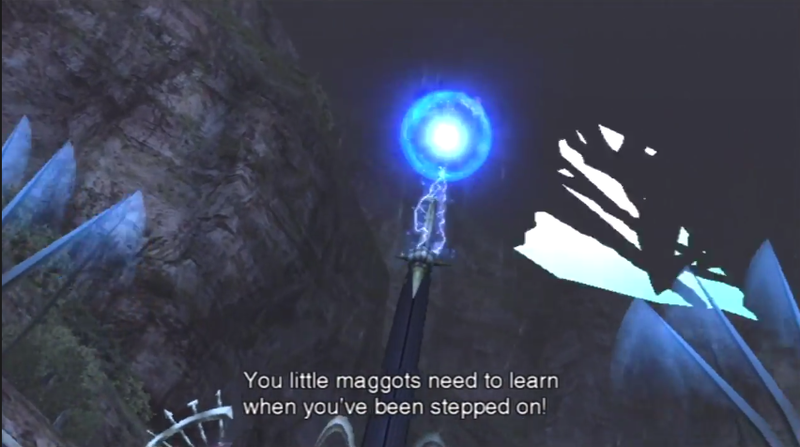 “You little maggots need to learn when you’ve been stepped on!” A small ball of blue light appeared at the tip of the pillar protruding from his head; the ball began to grow bigger. “Won’t change a thing,” Metal Face growled. He leaned forward so the ball was closer to the ground, the pillar pointing towards them like a cannon. The beast wheeled around in the sky to drop more green lightning on the Mechon, who leapt from side to side to dodge them. 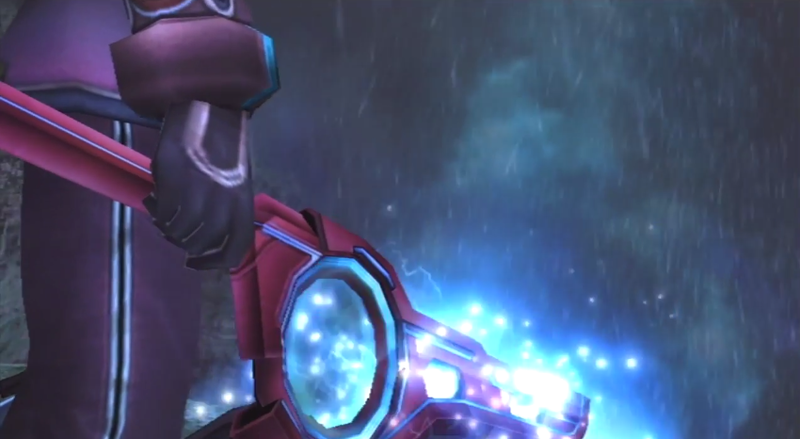 “Now’s our chance!” shouted Shulk. 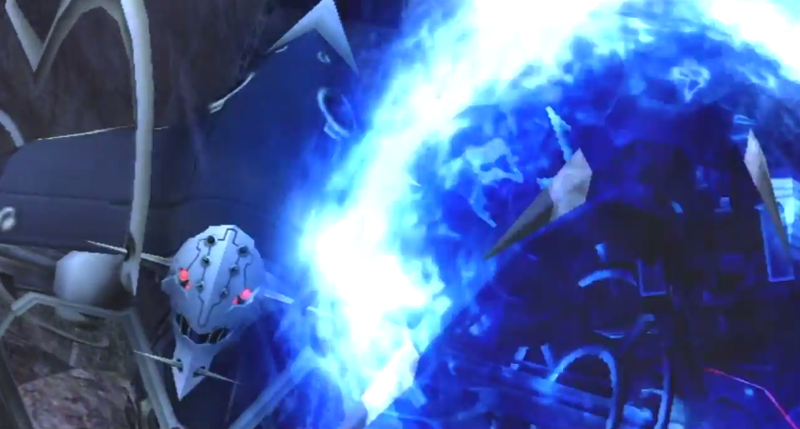 He dashed up Metal Face’s leg and rammed the Monado into his arm, leaving a deep cut in the Mechon’s armour. 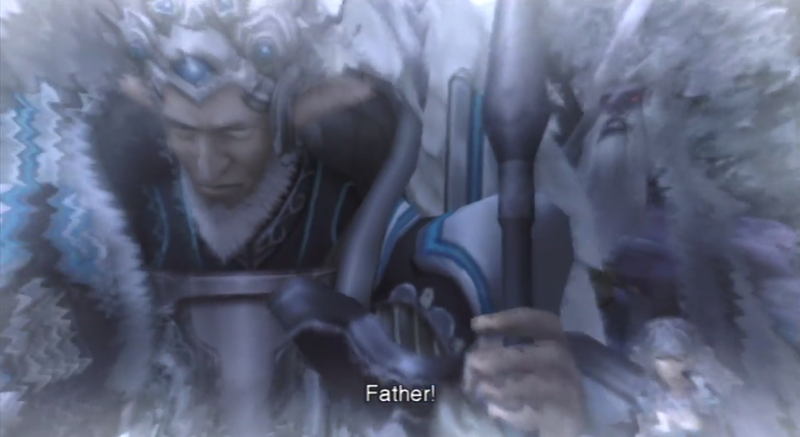 But Shulk’s eyes glowed blue, and he found himself pulled away from the present. 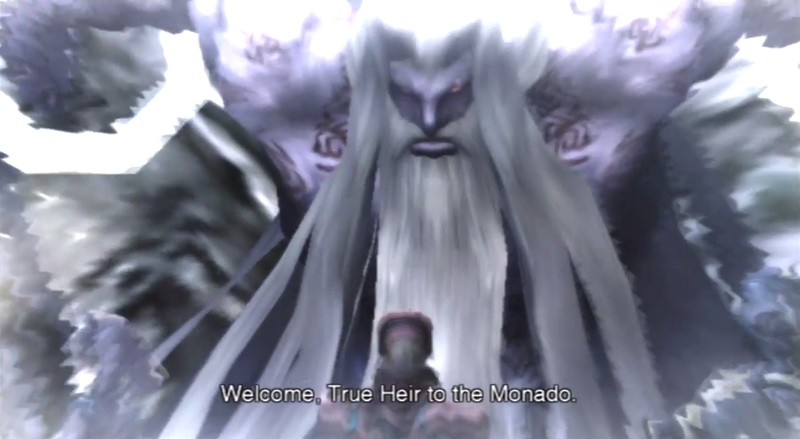 The vision changed, and an old man with a white beard stood holding a staff; Shulk could see the giant purple man behind him. 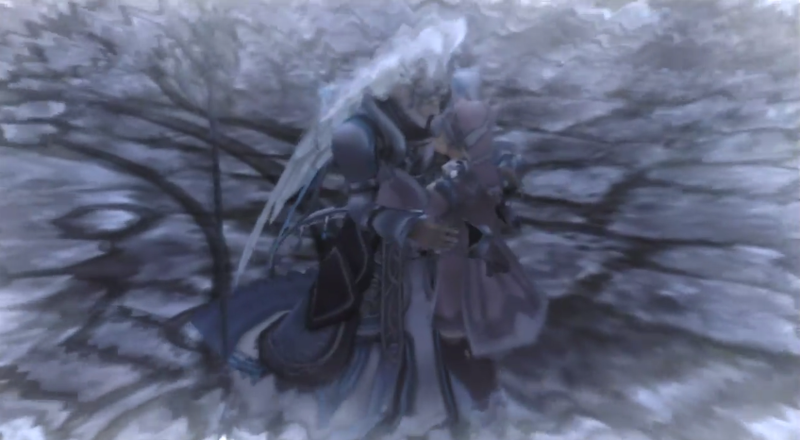 “Father!” The old man turned to hug a young woman as she ran to him. 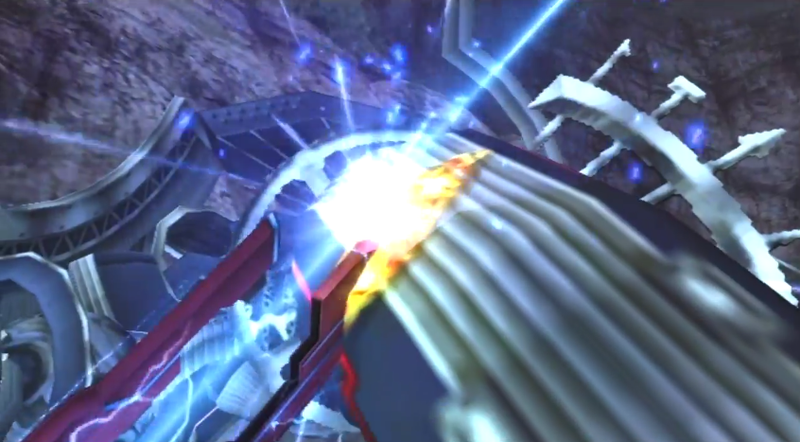 Shulk saw himself, as furious as he was now, the Monado drawn behind him, yelling up at the sky. 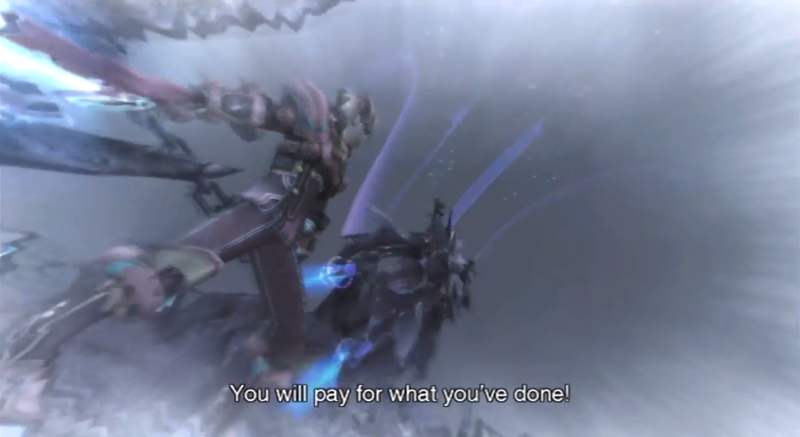 “You will pay for what you have done!” An unfamiliar Mechon flipped in the air, away from him. 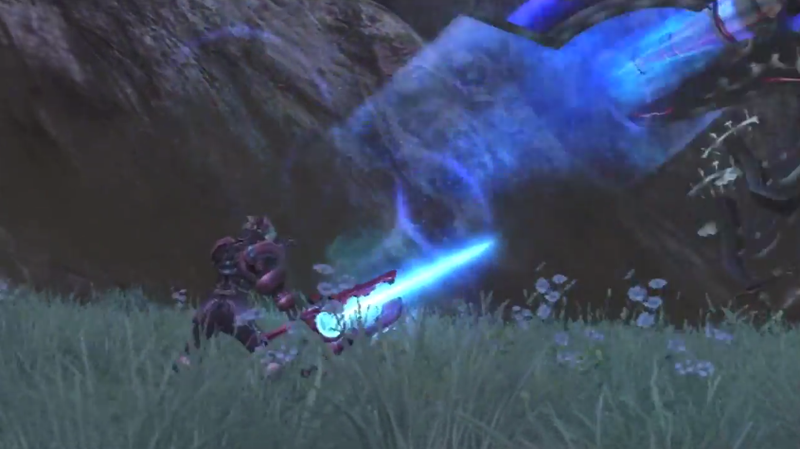 He saw himself bring the Monado, glowing brighter than he had ever seen it, down on Metal Face’s arm – and cutting through it. Metal Face, thoroughly irritated, turned to look at Shulk. “Enough of this!” He slapped Shulk away from him. “You got lucky, brat! Next time, your head is mine!” He changed form and took to the air, leaving the battleground behind. 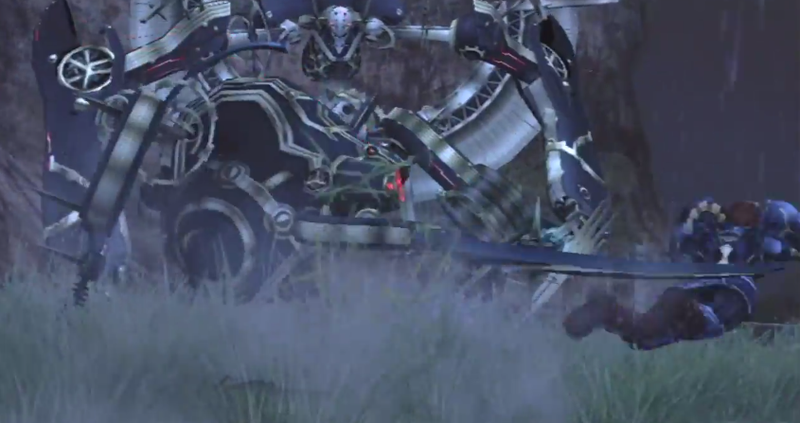 “You’re not getting away!” Shulk yelled, giving chase..
“Get back here!” roared Reyn, following Shulk. Shulk watched the black dot get smaller and smaller as it fled the scene. “Fine.” The Monado deactivated in his hands. The creature flew to the top of the cliff face, out of site of the party. It hovered over a man with silver hair. The man spoke to the creature. “You did well.” The creature lowered its head to meet his. “But what of the boy.” He listened as the bird made a low, guttural sound. “Well then, there is much to be done,” replied the man. Images taken using Scalz311‘s YouTube channel. I’m still transferring the previous chapters; please bear with me until it’s done.